Chemistry matters. Structure matters. Leadership matters. Jeffrey Lurie, Howie Roseman and Doug Pederson have worked together to build the Eagles into a Super Bowl winner and one of the best organizations in the league. A lot of that success is also due to the play of QB Carson Wentz. Things aren’t perfect inside of NovaCare, but they are good. The group is working together and the results show on the field. Go read this piece about the Packers, mostly about former coach Mike McCarthy and Aaron Rodgers. Phenomenal writing by Tyler Dunne, who used to be a Packers beat writer. He got sources to go on the record about McCarthy and Rodgers. Now think about Pederson and Wentz. They eat dinner together on Thursdays, in part to go over the gameplan and in part to socialize. Pederson is a former NFL QB so he understands just how important it is for the coach to embrace his star player and to build a strong relationship. We don’t know how things will be in 2026, when the duo has had a decade together (assuming they are both still here). Maybe they clash by that point. Or maybe they’ll have one of those special relationships that is so rare. After three years together, Pederson and Wentz remain a happy couple. Pederson gives his star QB plenty of input into the gameplan and freedom on gameday. Wentz works with the coaches and doesn’t publicly question them. He says all the right things when talking to the media. That article really illustrates the importance of a strong owner. Lurie is hands-on in the right way. He doesn’t micro-manage, but he is involved with big decisions. He has good relationships with his GM, coach and even some players. The Packers didn’t really have anyone for McCarthy and Rodgers to answer to. That made the situation worse. 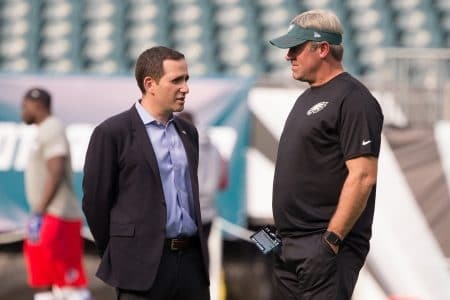 I wrote a recent piece for PE.com on the benefits of Lurie, Roseman and Pederson working together so well. Late in the Andy Reid era, things were not so harmonious. Reid was trying to be the coach-GM. Roseman was climbing the power ladder and had his share of battles with others. Joe Banner was trying to protect his turf. Lurie was trying to be loyal to a variety of people, who all had conflicting interests. As you remember, that situation didn’t play out so well for anyone. Thankfully, things are different now. Pederson just wants to coach so that makes the current situation much easier. He has no interest in being a GM. Roseman has eaten some serious humble pie so he’s not as ruthless as he was previously. Lurie is getting older. Age has a way of changing your perspective on things. We’ll have to see if this structure can continue to be effective. When it comes to ultra-successful people, some of what makes them so successful can eventually hurt them. Human beings tend to be flawed. It feels like the Eagles have the right formula for sustaining success. Strong owner. The front office is solid. Smart head coach and a good overall staff. There are also some really good leaders in the locker room. As the Packers story shows us, that can be fragile. The Packers had some amazing talent, including arguably the most talented QB in NFL history. And yet they won a single Super Bowl. They had some bad playoff losses. It will be interesting to see what the Eagles do this year. Carson Wentz will have a chip on his shoulder. Nick Foles is gone. There will be quite a few guys in the final year of their deal. The coaches have to figure out how to feed a lot of talented skill players on offense. I expect the team to compete for another title, but there are some situations that could go sideways. That’s why it is so important to have structure and leadership. The Eagles have responded well to rock-bottom moments in each of the past three years. After the horrible, lifeless loss in Cincinnati in 2016, the team played better down the stretch and won the final two games. After Wentz’s injury in the Rams game in 2017, the Eagles went and won the Super Bowl. Last year the team got demolished in New Orleans. They responded by going 5-1 down the stretch and added a postseason win. The Eagles are talented, but I also think part of the success is due to strong intangibles. That stuff matters.